Floyd Reid, Jr. was born September 4, 1927 in Bridgeton and grew up outside Cincinnati, in Hamilton, Ohio. 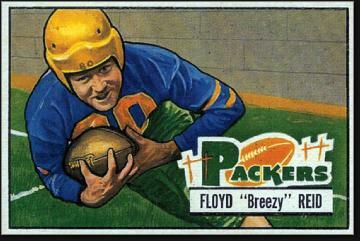 A solidly built all-around athlete with excellent speed, Floyd earned the nickname “Breezy,” which stuck with him his entire sports career. After starring for the Hamilton High football team, Floyd accepted a scholarship to the University of Georgia in 1945. Because of wartime manpower shortages, freshmen were allowed to play varsity ball. The Bulldogs began their season against Clemson. Floyd fielded the opening kickoff on the 11 yard line, picked up his blockers and ran straight up the field for an 89-yard touchdown. He was still a day short of his 18th birthday. Floyd shared the backfield with Johnny Rauch and Charley Trippi during his career. Floyd was known more for his power than his speed, earning a reputation as the club’s most reliable short-yardage back. He played a total of four years for coach Wally Butts, sitting out the 1946 season because of an injury. The Chicago Bears selected Floyd in the 9th round of the 1950 draft. He did not make the team, but caught on with the Green Bay Packers. In Green Bay’s first meeting with the Bears that October, Floyd ran for a 14-yard touchdown. He was the team’s top ground gainer in 1953 and 1954 with 492 and 507 yards, respectively. Floyd retired after the 1956 season with 1,964 yards and 13 rushing touchdowns, and 72 receptions for another 5 touchdowns. In 1957, Floyd stayed with the Packers as a part-time scout, and in 1958 became the team’s backfield coach and advance scout. In 1960, Floyd was hired to coach the backfield for the Buffalo Bills of the new American Football League. The defensive backfield coach was Harvey Johnson, who was also born in Bridgeton. He stayed there for two seasons. In 1962, he became an assistant at the University of Maryland under Tom Nugent. Floyd eventually got out of coaching and moved back to the Cincinnati area. He retired there and lived until the age of 66. His grandson, Tyler Minges, carried on the family athletic tradition, becoming one of the top prep baseball and football players in the state.